How to Size a Furnace For My House? Is the furnace I am getting a right fit for my home? – Many homeowners often ask this question and it’s an important topic when purchasing any heating system. The furnace plays a significant role for our home by keeping us warm during the colder months. It is important to have the right sized furnace to have effective heating year round for your home, to save you money on energy bills, and to allow your furnace to last a long time. Calculate the square footage of your home. Before you start, it is important to mention that you do not have to measure for rooms that do not have vents, and you do not have to measure for rooms that you are not expecting to heat. To get the total square footage for your house start by measuring the length and width of each room, take these two measurements and multiply them together. Take all the numbers you have collected and add them together to get the total square footage. Take climate into account. For example, homes that experience colder winters like in the Midwest will require a furnace with more heating power. British Thermal Units. Gas furnaces are measured in British thermal units or BTUs. 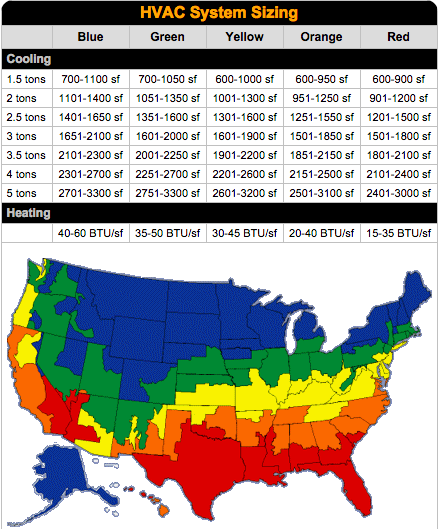 A BTU is the amount of water energy needed to cool or heat one pound of water by one degree Fahrenheit. Consult an HVAC Technician for Accuracy. Other factors need to be accounted for like the age, construction of your home, the amount of insulation, climate, and the seals you have to provide the necessary information to perfect sizing for your furnace. A licensed HVAC technician with the proper experience, and technology can help you figure out all the missing components to your equation. New furnaces are expensive pieces of equipment, but they are necessary to ensure the comfort of your home, especially during the cold winter months. If you are going to spend the money on getting a new furnace, it is going to be with you for 10-15 years if maintained correctly. If your furnace is not the perfect size, you will run into some problems from wasting resources, wasting energy, to losing your hard earned money. Do not pay more for repairs and replacement costs down the road. Here is a more in-depth look on improper furnace sizing. These are all problems and telltale signs that your furnace may be too big for your home. If your furnace breaks down from constantly cycling on and off, you will need to spend more money replacing it with a new one. The problem with an undersized furnace is the times that they do not work well, and this will mean your rooms being unable to reach the desired temperature. When your furnace is failing to reach the desired temperature, it will constantly run in an attempt to, this will lead to your furnace overworking itself and causing higher costs for energy. There will be times where you will find your furnace is on and working, but your home is still cold due to insufficient heating. The benefits of having a correctly sized furnace are simply the fact of it working the way you would expect it to. The right furnace for the right home means warm temperatures when you need it with a tiny margin of error (maybe 1%).